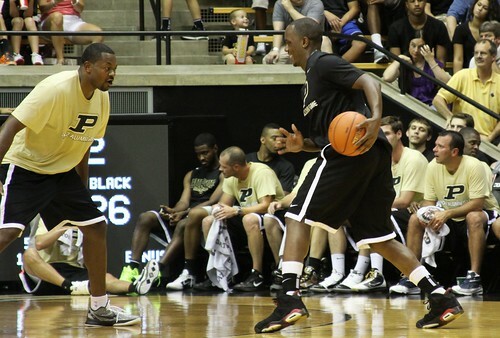 Earlier this afternoon, I made the drive up to Purdue to watch the alumni game and team scrimmage. I'll cover the scrimmage in a future post, as we learned a lot about the new freshmen and some expected strengths and weaknesses for the coming season. The highlight of the afternoon, however, was seeing so many alumni come back for the game. 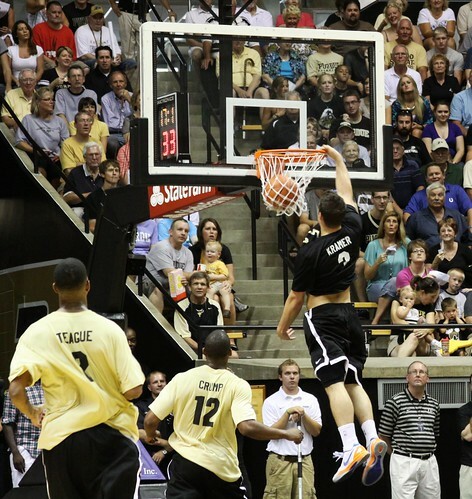 Despite the 100 degree temperatures inside Mackey Arena, which turned it into a literal sauna, former Boilermakers young and old suited up to impress the fans and show they still had some skills. 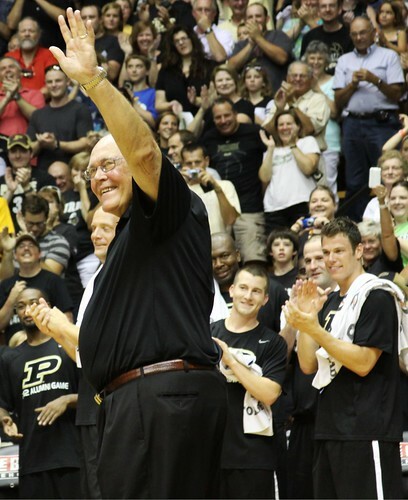 The game pitted Coach Keady's black team against Matt Painter's gold team, and it looked like the deck was stacked for the black team. The worst alley-oop I have ever seen, thrown by Cardinal to Kramer. 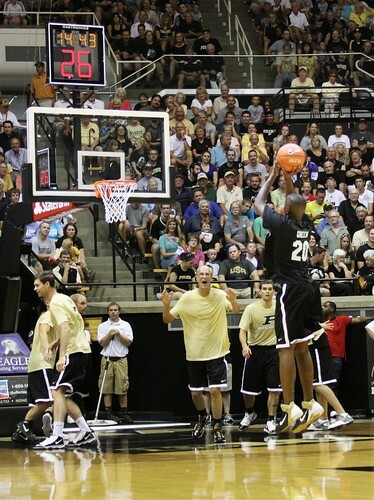 It banged so high and hard off the backboard that I don't even think JaJuan could have gotten a piece of it. Waiting for Kenny Lowe to slap the floor in defensive exuberance. It didn't happen. Seeing Chris Reid dominate inside. Apparently he's only good when playing against old guys. I was excited to have tickets in the comfortable black club seats, but I decided to take my nice DSLR camera and try to get closer for some pictures. 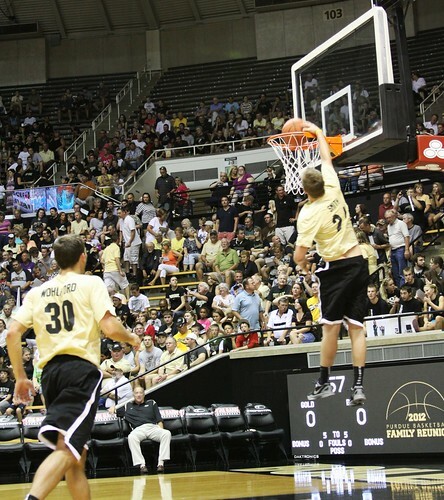 While GoBoilers.net isn't yet popular enough to get a media pass, no one seemed to mind as I sat courtside the entire time. I was having so much fun, and trying hard to get good pictures, that I didn't even realize the game was actually close. Down the stretch Teague and Lew Jack made offsetting threes, and Keady called a timeout with about 24 seconds to go, the score knotted at 70. I'm not sure what play Keady called, but it clearly wasn't the old "let Lew burn the clock down real low and then fail to find an open man, thereby being forced to throw up a ridiculous three." As we all know, Painter's the one that calls that play. I kid, I kid. Whatever the plan (feed Cardinal? ), it didn't work, and Lew was forced to make something happen. 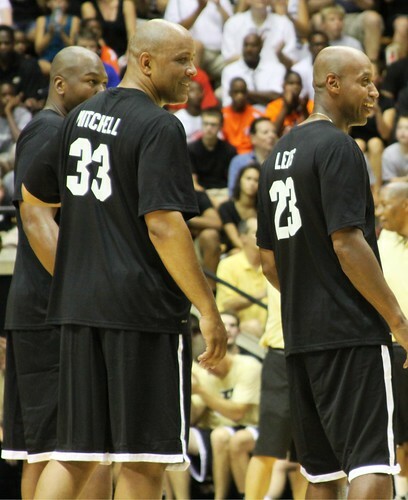 He shot up a highly contested three, and as time expired, it sank, the black team won, and Lew stoically stared down his opponents and slowly walked to the other side of the court. The crowd went nuts, and it was a very fitting end to the event. If the Paint Crew were there, I'm sure he would have jumped into their arms. 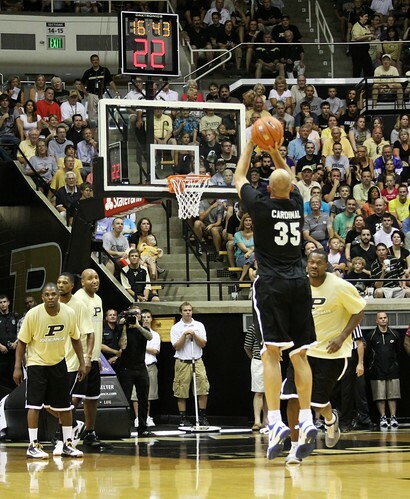 During a break in the current team's scrimmage, all the alumni present came out onto the court, and it was a great chance to see some of the older players, as well as more recent guys like JaJuan, Carl Landry, and Robbie. 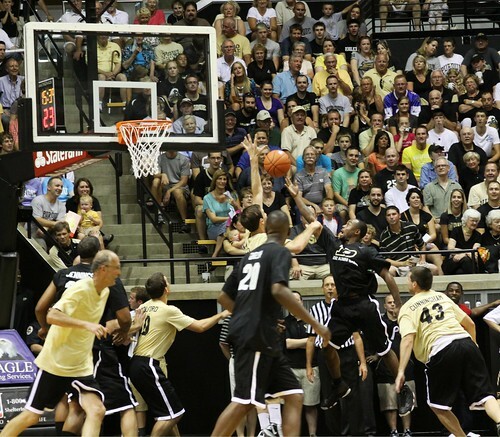 I'm so glad Purdue held this event, and I hope it was enjoyable to the fans (despite the heat), the alumni, the current players, the coaches, and the stud recruits that were there to watch. Below you can enjoy some of the hundreds of photos I took. 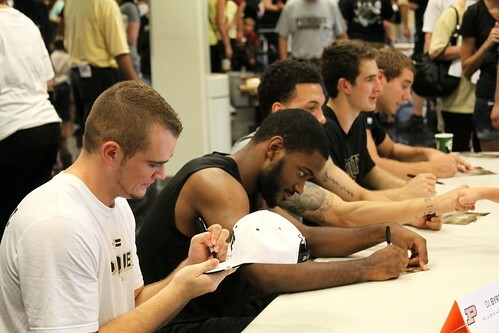 Half the team signing autographs before the scrimmage. The lines were hundreds long. Bryson Scott, Kendall Stephens, and Basil Smotherman hiding in the corner but signing some items for fans who noticed them. I think Bryson liked the photo op. Robbie and Cardinal having a laugh, possibly about knee pads. Caption contest! 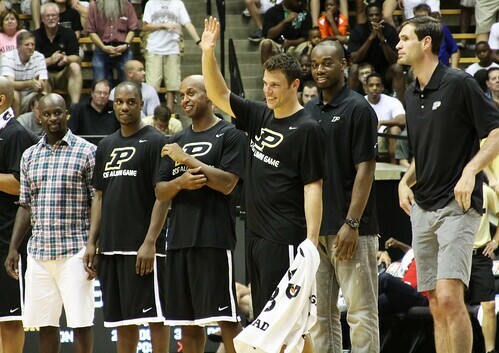 My entry: "Hey guys, look at Tim Ervin over there. There's actually someone shorter than Bobby!" David Teague, how I missed you! Tarrance Crump playing some tough defensive on Bobby Buckets. The bench likes it. Kramer winding through traffic and dunking! 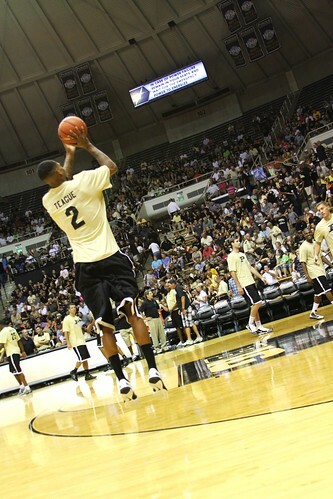 This picture isn't really about Marcus Green shooting a three. It's about Steve O'Neil, who's in his upper-60's, screaming like a crazy person trying to distract the wide-open Green. Sure, it was great to see JaJuan, but I was more amazed to see Ivan Kartelo for the first time in almost a decade. If only he had been waving his Kartelo Towel from the bench during the game. A few interesting thoughts from this photo. 1. Nice to see you Carl Landry! Wish your new $8 million contract with the Warriors would have let you play. 2. Nice to see you Brandon McKnight! Looking sharp. 3. Matt Kiefer, did you just hit puberty and you're still getting used to your size? I think McKnight needs to give you a makeover. 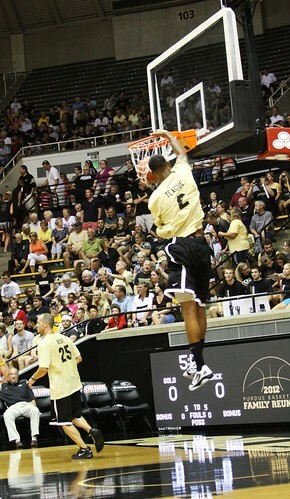 How is Danny Hope Viewed Around the Big Ten?